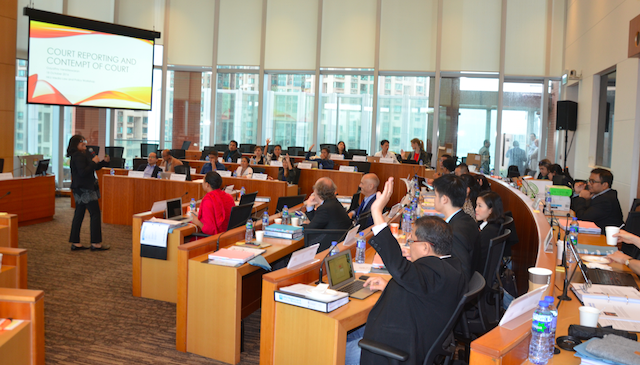 From October 17 to 20, 2016, 30 lawyers and journalists from 10 Asian jurisdictions converged in Hong Kong for a 4-day Media Law & Policy Workshop - beset by 2 typhoons. The Centre for Comparative and Public Law (CCPL) co-hosted the event with the Journalism and Media Studies Centre (JMSC) at the University of Hong Kong, where both Centres are housed. Participants from across Asia participated in sessions facilitated by media law experts from around the globe on subjects such as the international framework for freedom of expression, contempt of court and court reporting, data protection and data privacy, access to information and protection of sources, national security and sedition and strategic litigation. Speakers included regionally based practitioners, in-house counsel, Biglaw lawyers, journalists and academics. HR Dipendra, a Malaysian-based lawyer and media defense expert led an engaging session on the frontier of media law for many in attendance: online speech and digital crimes. Overall, Dipendra said many countries have scrambled to deal with freedom of speech on the Internet, taking the traditional methods of dealing with press and suggesting its blanket adoption for Internet publications. But that hasn’t worked as well as they would hope. “I don’t think most countries have worked out how to deal with publications online,” he said. Examples of countries taking traditional print policy and giving it blanket online power include the Philippines, Malaysia, Singapore and Thailand. He went on to note that while Internet penetration has risen dramatically for all countries represented at the Workshop, it has not done so hand in hand with press freedom. Peter Noorlander led two sessions during the Workshop, on National Security and Sedition and on Access to Information. In the latter session, he pointed out that Freedom of Information "is not just about Access to Information, but all the laws relating to disposal of information (as well)". When challenged by audience members whose own jurisdictions faced significant challenges in obtaining material from Governments, he pointed out the success that India has recently had in their training of Information Officers nationwide. With proper and sufficient Government support, officers in India now have a systematised method of responding to requests. The discussion which followed his presentation on sedition laws and defences to sedition laws demonstrated the level of regional concern on the potential abuse of national security laws as a pretense to control the free dissemination of ideas and opinions. Noorlander reminded the audience that some of the more high-profile cases in this regard have been solved not through litigation but simply by "going big, going public, making a noise" – to draw international attention to the matter as a means of persuading governments to impose less severe penalties. He noted that victories have also been won in this space by technicalities or procedural irregularities. And while admittedly those victories were pyrrhic – it is important for advocates to understand that there are several strategies to choose from when defending clients in these spaced. Other highlights of the Workshop included a lively lunch talk by the Hon. Mr. Justice Michael Hartmann, a spirited moot court exercise led by Nani Jensen Reventlow, Associate Tenant at Doughty Street Chambers and Fellow of the Berkman Klein Centre for Internet & Society at Harvard University, and a stimulating dinner talk by Gillian Phillips, Director of Editorial Legal Services at the Guardian News & Media, where she recounted her role advising the outlet about the U.S. National Security Agency leaks by Edward Snowden. In the Workshop de-briefing held on the final day of the event, participants reflected on the similarities facing all jurisdictions represented in the room in terms of challenges to the freedom of expression, collection of information and reporting more generally. Participants also noted that the legal strategies and experiences shared by participants both consoled and inspired them. The Workshop was made possible through the generous sponsorship of the Open Society Foundations and the Hong Kong British Consulate General. Our thanks to all the participants for descending upon Hong Kong despite the onset of Typhoon Sarika and for their patience and understanding when Typhoon Haima arrived just as the Workshop concluded.